London South Bank University (LSBU) recently held a lively debate about nursing funding and places, a week before Paul Scully MP leads a debate in Parliament on the subject. 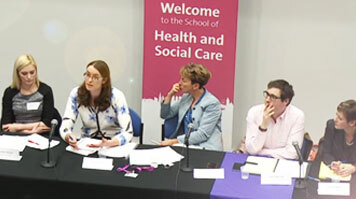 At the heart of the debate, co-hosted by LSBU’s School of Health and Social Care and WeNurses, was the question of whether removing both restrictions on the number of nursing student places and also NHS-funded bursaries and fees for nursing students would increase the supply of registered nurses in the UK. Arguing in favour of the proposed changes were Elisabeth Jelfs, Director, Council of Deans, and Charlotte Johnson, Newly Qualified Nurse, Papworth Hospital NHSFT, who expressed how changes to the way student nurses were funded and recruited could help to widen access, improve attrition rates and provide better funding options for a range of students. In response, Robert Waterson, a Newly Qualified Staff Nurse at Guy’s and St Thomas’ NHS Foundation Trust and LSBU graduate, and Serena Ruffoni, a current LSBU nursing student, argued that increased debt levels could deter many potential nurses from entering the healthcare profession, affecting mature students in particular. The debate was chaired by Professor Becky Malby, Professor of Health Systems Innovation at LSBU, who took questions from the floor after panellists had spoken. The debate continued online with a real-time Twitter chat under the hashtag #WeNurses. LSBU is one of the largest providers of clinical education for allied health and related professions in the UK. The LSBU Health Debates create a space where important and contentious topics can be discussed intelligently, critically and openly. The idea is not necessarily to seek solutions but to engage as many people as possible in an objective and vigorous dialogue. Find out more about the School of Health and Social Care at LSBU.